GNOME (General NOAA Operational Modeling Environment) is the modeling tool the Office of Response and Restoration's (OR&R) Emergency Response Division uses to predict the possible route, or trajectory, a pollutant might follow in or on a body of water, such as in an oil spill. Download the latest version of GNOME. Predict how wind, currents, and other processes might move and spread oil spilled on the water. Learn how these predictions of where and how oil might move are affected by uncertainty in observations and forecasts for ocean currents and wind. See how spilled oil is expected to change chemically and physically, known as weathering, during the time that it remains on the water surface. To use GNOME, you describe a spill scenario by entering information into the program. GNOME then creates and displays an oil spill "movie" showing the predicted trajectory of the oil spilled in the scenario. In addition to this animation, GNOME estimates the amount of oil beached, still floating, or evaporated at specific times. Along with GNOME, most users also will want to download the Location Files for their regions of interest, such as the Gulf of Mexico or Pacific Region. Location Files contain prepackaged tide and current data and make it easier to work with GNOME. GNOME was developed by the Emergency Response Division of NOAA's Office of Response and Restoration. The latest version is GNOME 1.3.10, posted November 30, 2017. 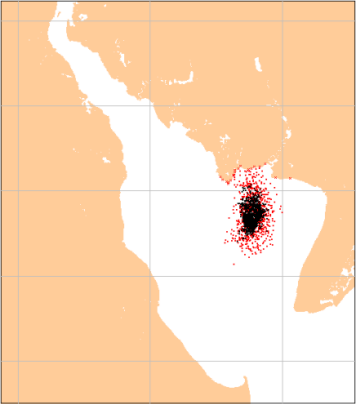 GNOME model output depicting relative distribution of oil. Downloading, Installing, and Running GNOME: Download a Windows or Mac version of GNOME and view instructions for installing and running it. GNOME User's Manual and Tour: Download the GNOME Manual and try the Learning the Basics tour described in Chapter 2. GNOME Location Files and Associated Resources: Find files you can use to model spill scenarios set in particular areas (such as Prince William Sound, Alaska, or Long Island Sound, New York) and example problems you can work to build your understanding of GNOME. GNOME Toolkit: Get tools for displaying GNOME trajectories in ArcView 3.x and ArcMap 9.x/10.x. Learn about and subscribe to the GNOME Listserver. Frequently Asked Questions about GNOME: Find answers to frequently asked questions (FAQs) about GNOME, including how to get Location Files and how to use GNOME's Diagnostic Mode to create Diagnostic Save Files. GNOME News: Find out about the latest GNOME developments as well as new and upcoming GNOME products.